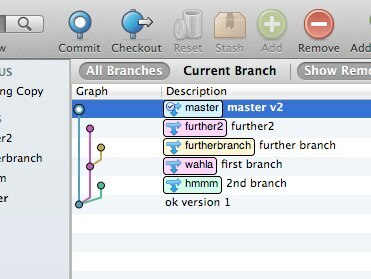 I've seen some books and articles have some really pretty looking graphs of git branches and commits. How can I make high-quality printable images of git history? Update: This answer has gotten far more attention than it deserves. It was originally posted because I think the graphs look nice and they could be drawn-over in Illustrator for a publication– and there was no better solution. But there now exists much more applicable answers to this Q, such as fracz's, Jubobs', or Harry Lee's! Please go upvote those!! Update 2: I've posted an improved version of this answer to the Visualizing branch topology in git question, since it's far more appropriate there. 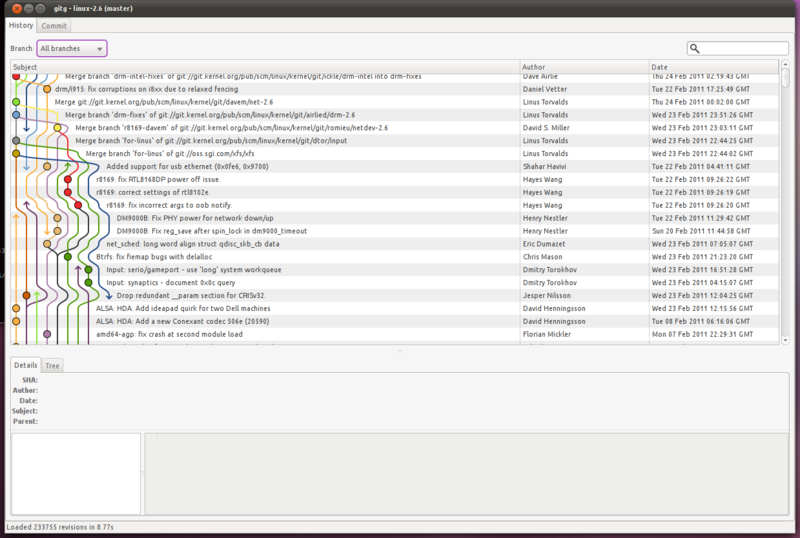 That version includes lg3, which shows both the author and committer info, so you really should check it out. Leaving this answer for historical (& rep, I'll admit) reasons, though I'm really tempted to just delete it. or: here's a graphviz alias for drawing the DAG graph. I personally use gitx, gitk --all and gitnub. Generate it with Git Grapher by @bsara. Built on top of TikZ & PGF, gitdags is a little LaTeX package that allows you to effortlessly produce vector-graphics commit graphs, and more. Automatic generation of an existing repository's commit graph is not the purpose of gitdags; the graphs it produces are only meant for educational purposes. 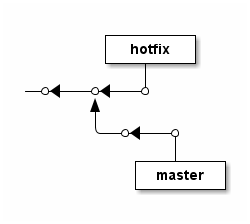 How can I do a bugfix on master and integrate it into my less stable branch(es)? 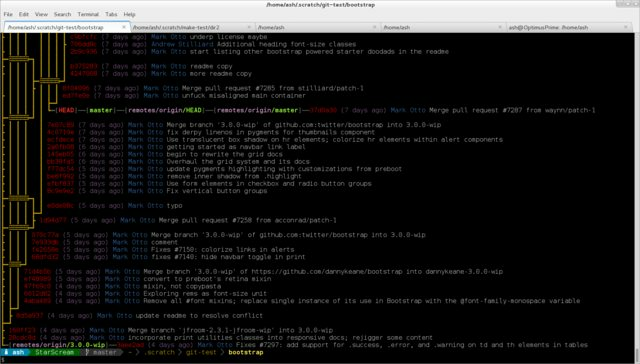 How does git commit --amend work, exactly? Why does Git tell me "Not currently on any branch" after I run "git checkout origin/<branch>"? What is the difference between merging master into branch and merging branch into master? 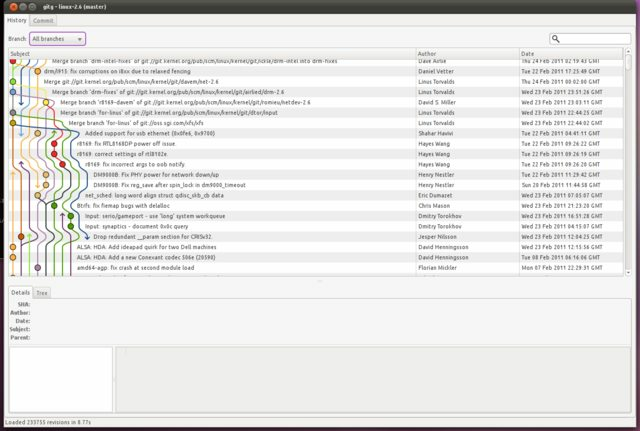 Gitg is a clone of Gitk and GitX for GNOME (it also works on KDE etc.) which shows a pretty colored graph. It is actively developed (as of 2012). It lets you sort the commits (graph nodes) either chronologically or topologically, and hide commits that don't lead to a selected branch. 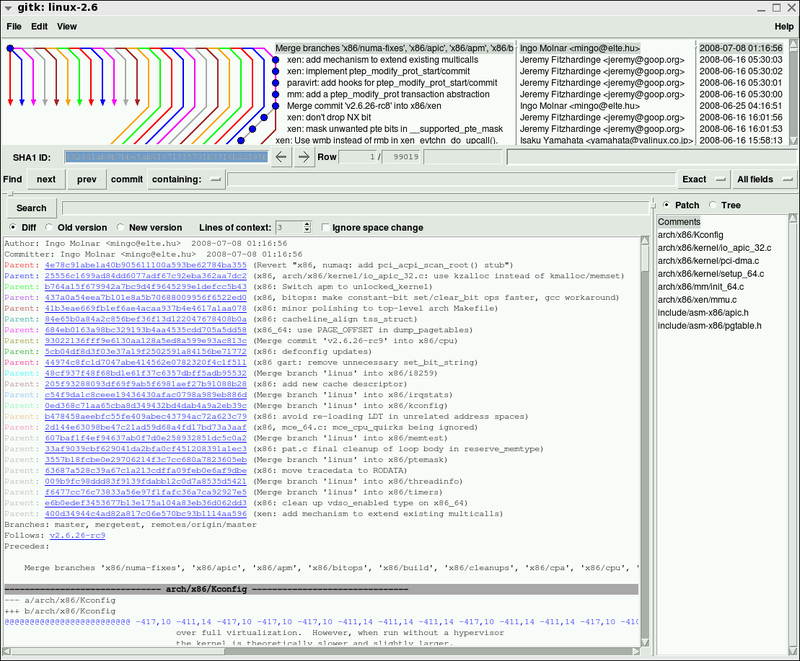 It works fine with large repositories and complex dependency graphs. SourceTree is a really good one. 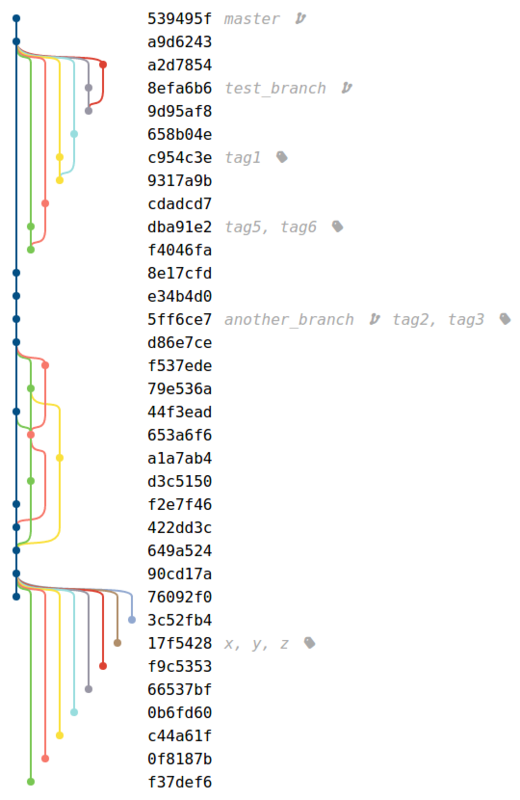 It does print out a good looking and medium size history and branch graph: (the following is done on an experimental Git project just to see some branches). Supports Windows 7+ and Mac OS X 10.6+. 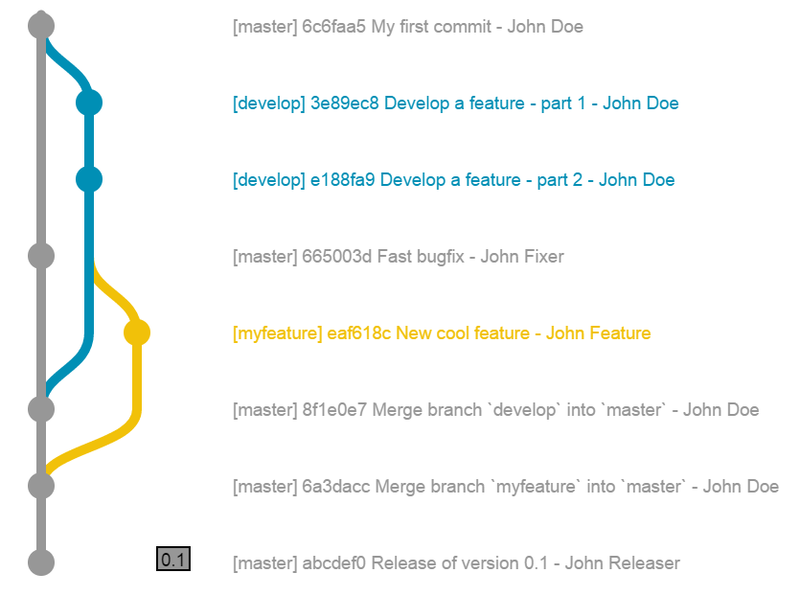 I just wrote one tool that can generate pretty git commits graph using HTML/Canvas. And provide a jQuery plugin which make it easy to use. 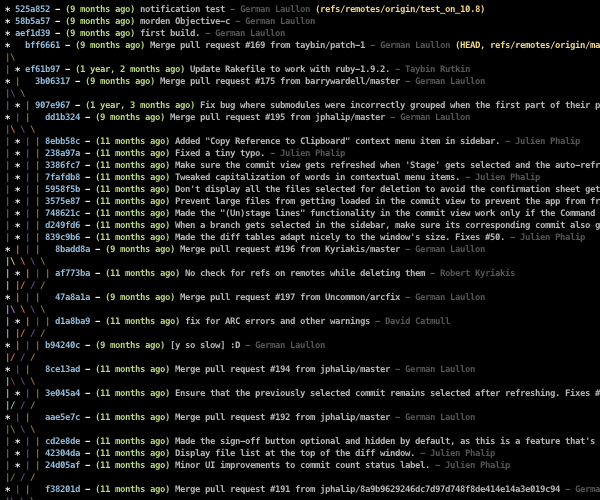 git-forest is an excellent perl script I've been using for more than a year and I hardly use the git log command directly any more. It uses unicode characters to draw the lines in the graph giving a more continuous look to the graph lines. 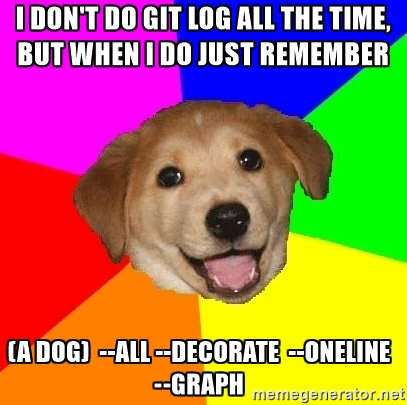 You can combine --reverse with the graph output, which is not possible with the regular git log command. It uses git log internally to grab the list of commits, so all options that you pass to git log can also be passed to this script as well. git-big-picture and BranchMaster are similar tools that try to show only the high-level structure of a graph, by only displaying how tags, branches, merges, etc. are related. This question has some more options. 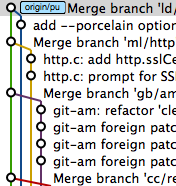 Upload output from git log --pretty='%h|%p|%d' directly into the tool and then click on the "download graph.svg" link. The tool is pure-client-side, and so none of your Git data is shared with my server. You can also save the HTML + JS locally and run it using "file:///" URL's. Verified on Chrome 48 and Firefox 43 on Ubuntu 12.04. 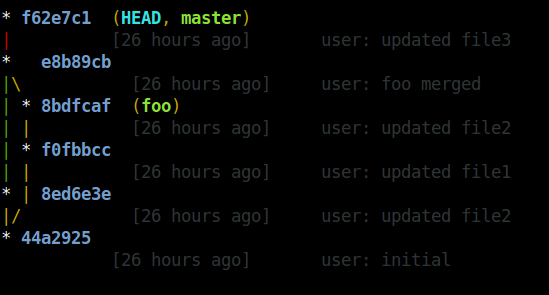 I've added three custom commands: git tree, git stree and git vtree. I'll go over them in that order. 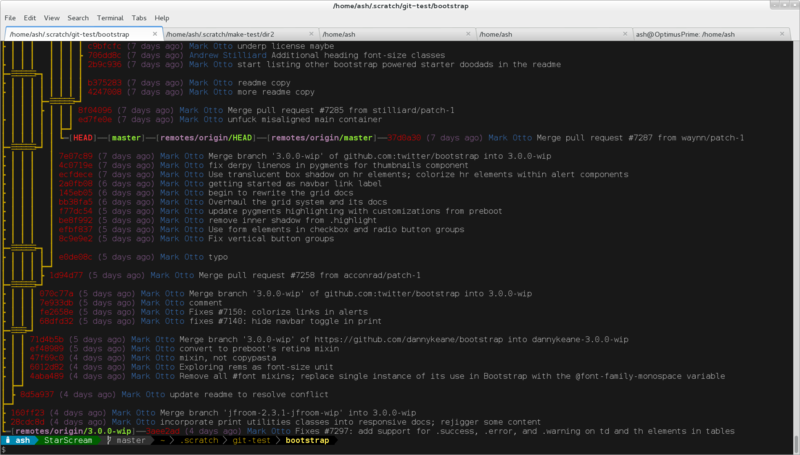 With git stree and git vtree I've use bash to help with the formatting. EDIT: This works with git version 1.9a. The color value 'auto' is apparently making its debut in this release. 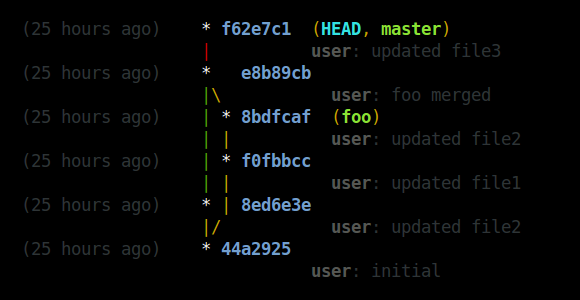 It's a nice addition because branch names will get a different color. This makes it easier to distinguish between local and remote branches for instance. --pretty=format:'%C(auto)%h%d %C(reset)%s %C(bold blue)%ce %C(reset)%C(green)%cr (%cd)'"
logd   = log --color --date-order --date=local --graph --format=\"%C(auto)%h%Creset %C(blue bold)%ad%Creset %C(auto)%d%Creset %s\"
logdr = log --color --date-order --graph --format=\"%C(auto)%h%Creset %C(blue bold)%ar%Creset %C(auto)%d%Creset %s\"
logt  = log --graph --color --format=\"%C(auto)%h %d %<|(100,trunc) %s\"
In Git 2.12+ you can even customize the line colors of the graph using the log.graphColors configuration option. As for the logs' format, it's similar to --oneline, with the addition of the author name (respecting .mailmap) and the relative author date. 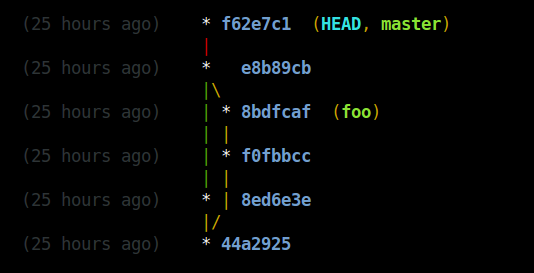 Note that the %C(auto) syntax, which tells Git to use the default colors for commit hash, etc. is supported in Git >= 1.8.3. 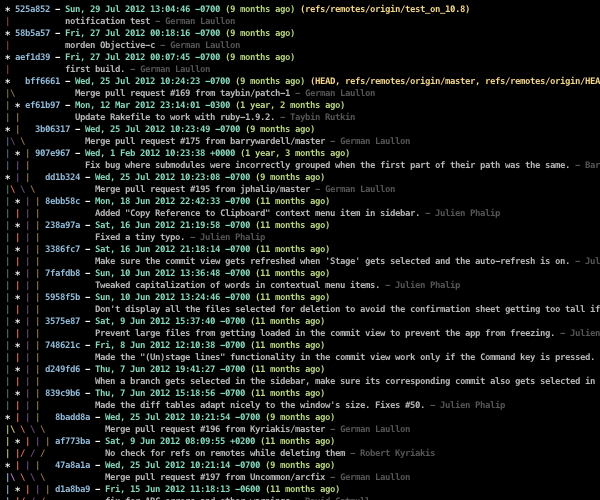 Generates a PNG or SVG representation of your Git repository's commit history. Did you try gitk or gitk --all ? However it doesn't have a print/save img as function. This is my terminal variation, similar to many answers here. I like to adjust the flags passed to less to prevent word wrapping. I set this to an alias for quick access since the command is a bit cumbersome. I suggest tig https://github.com/jonas/tig , a much much better command line tool for git. Try ditaa. It can transform any ASCII diagram into an image. 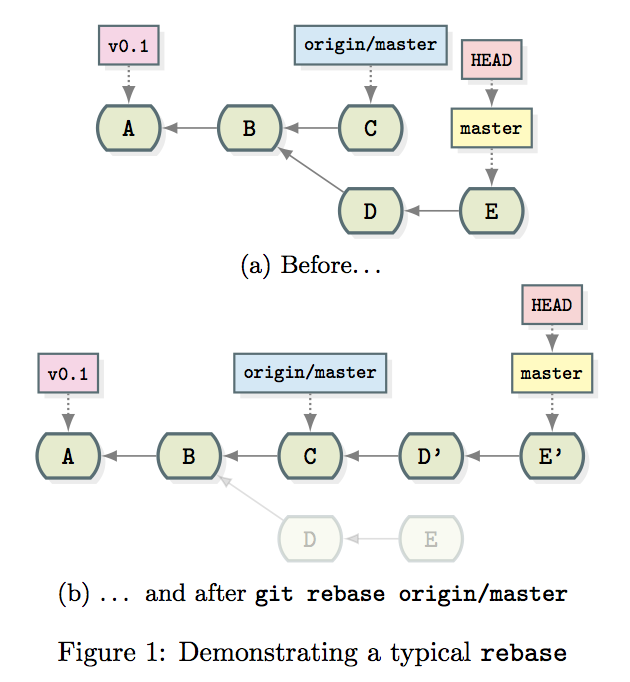 Although is was not designed with Git branches in mind, I was impressed by the results. It also supports background colors, dashed lines, different shapes and more. See the examples. 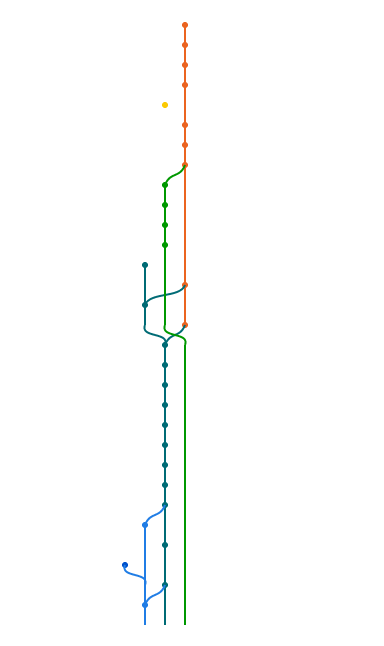 There's a funky Git commit graph as one of the demos of the Raphael web graphics library. The demo is static, but it should be easy enough to take the code and swap out their static data for a live set of data -- I think it's just Git commit data in JSON format. I don't know about a direct tool, but maybe you can hack a script to export the data into dot format and render it with graphviz. 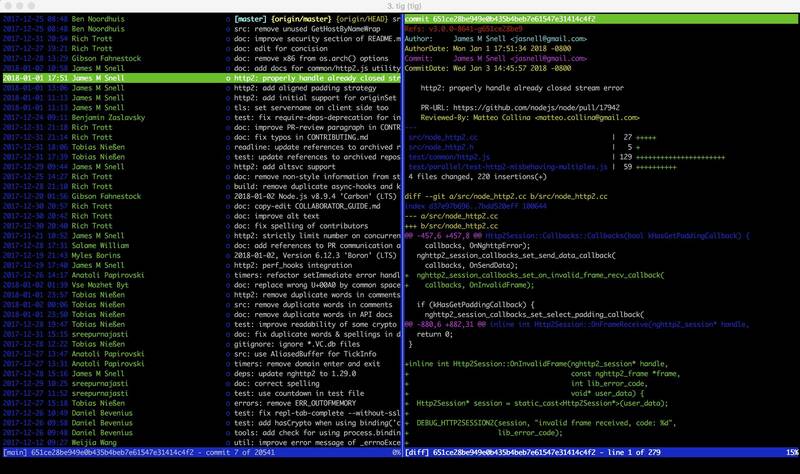 For OSX users, I've taken the @gospes example and slightly modified it for gsed (gnu-sed installed via homebrew) and adjusted the colors (to work with a black background, not sure how the original example could possibly render the way it does in the example since it specifies black text on a terminal with a black background). The key for OSX is to first install gnu sed (which has the -r option). Most easily done with homebrew, which will not overwrite the system-installed sed, but will instead install gnu sed as "gsed". Hope this helps @SlippD.Thompson who commented above about OSX not working. If your repository sits on Gitlab, you can use its graph representation as that is rendered as SVG in your browser. 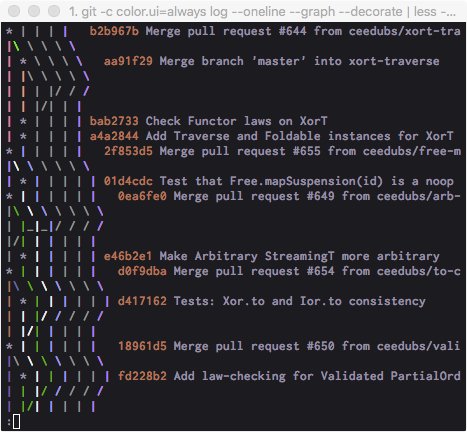 git config --global alias.tre "log --graph --decorate --pretty=oneline --abbrev-commit --all --format=format:'%C(bold blue)%h%C(reset) - %C(bold green)(%ar)%C(reset) %C(white)%s%C(reset) %C(dim white)- %an%C(reset)%C(bold yellow)%d%C(reset)'"
Not the answer you're looking for? 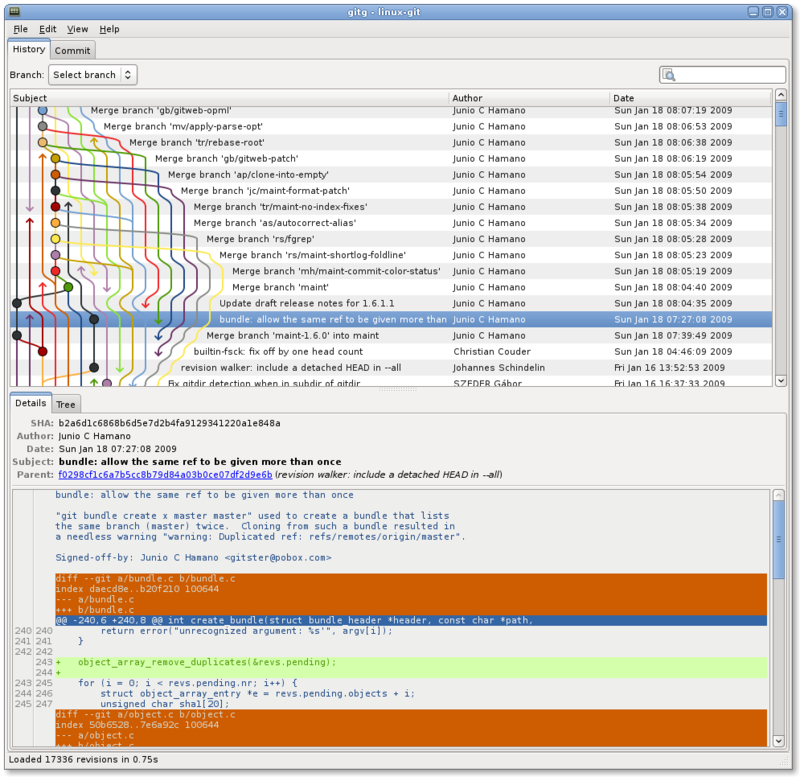 Browse other questions tagged git git-log or ask your own question. Why does Git tell me “Not currently on any branch” after I run “git checkout origin/<branch>”?